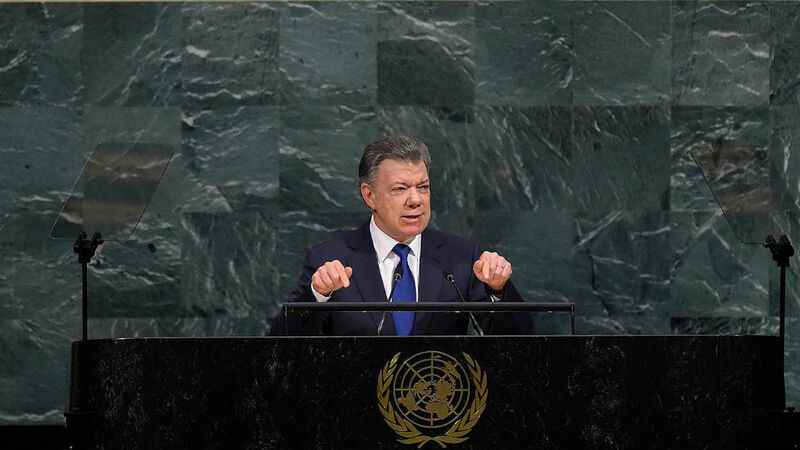 Colombian president Juan Manuel Santos repeated his call for a change in approach towards the war on drugs as he delivered his final speech as president before the 72nd United Nations General Assembly on Tuesday. The head of state reminded the world of the “high price” Colombia has paid in an apparent jibe at US president Donald Trump’s threat to “decertify” as a partner in the war against drugs. “Colombia has paid a very high price, perhaps the highest of any nation and what is being seen is that the remedy has been worse than the disease,” said Santos to the delegates from all around the globe. “There is no simplistic way of pointing out who is solely responsible. We all are, under the principle of shared responsibility that we assumed several decades ago. They are wrong to say that this is only a problem of producing countries,” he added. Santos, who is due to leave office next year has long been a critic of global counter-narcotics policies and has persistently called to “rethink” the United States-led war on drugs for years, going as far as proposing the legalization of cocaine as an option as far back as 2011. The comments by Santos come just a week after his US counterpart threatened to “decertify” Colombia as a partner in combating the drug trade in Latin America. Santos is adamant that a dramatic shift in approach is needed particularly in relation to treating drug addiction as a public health issue rather than a criminal policy in order to turn the tide. “At the Special Session of the General Assembly on Drugs – which met last year on the initiative of Colombia – there has been progress, such as the call on states to protect human rights in their drug policies,” he said. After years of increased cultivation of coca, the base ingredient for cocaine, Colombia has begun working with the United Nations rather than the US to lower coca production as part of a peace process. Trump said he had “seriously considered” decertifying Colombia, but had not done so because of the South American country’s military partnership with Washington DC. Meanwhile Santos also took the opportunity to express his thanks to the UN for its assistance during the recent peace process that saw the Marxist-inspired FARC guerrillas disarm after more than 50 years of conflict against the state. The president humbly offered the Colombian peace process as an example to the world as to what can be achieved through dialogue. He said that if Colombia could end a conflict that left “hundreds of thousands of dead and millions of victims and displaced, there is hope for the conflicts that still exist on the planet!”.